Spring is the season when we're anxious to get out and work in the garden. I'm all for having fun in the garden, but I'm also big on easy garden maintenance. I've learned that if I take the time in early spring to tackle basic garden tasks I can have a weed-free garden all summer and into fall. Here's the basic plan I use to spruce up my garden every year starting in early spring. Rock walls, stone pathways, flowering bulbs and perennials plus evergreen shrubs form the basis of my low maintenance garden, shown here in late spring. In my gardening region, the last frost date comes at the end of May. But before I plant frost-tender flowers and vegetables in the garden, there's plenty of work to do in the yard. As soon as the snow and ice melt and the ground thaws, I start my garden cleanup. This process usually begins in early to mid April, and continues through early May. The first spring garden tasks I tackle are winter cleanup activities: removing downed sticks and twigs, pruning shrubs or trees (except for spring bloomers), raking up or sweeping away leaves and other plant debris from the lawn, pathways and garden beds, and cleaning out drains and gutters. Next I tackle weeding chores in my flower beds. I start with the most visible gardens - the beds near the doorway, along the entry walk, and by our driveway. I work on one bed at a time, digging out or pulling small and mature weeds from the garden before they spread or go to seed. I also tidy up the edges of each bed by trimming the sod and moving grass creepers. After weeding, I cultivate the soil around each perennial or shrub with a handheld tool to loosen and aerate the dirt and fluff up the mulch. I apply organic compost and fish emulsion fertilizer then add a fresh layer of mulch to the entire garden bed. If you don't use mulch on your gardens, simply cultivate around the plants, shrubs and bulbs and work your compost into the top layer of soil then add composted manure and apply a balanced organic fertilizer like fish emulsion. After I finish the basic cleanup chores in all the garden beds, I take stock of perennial flowers and herbs to see which plants didn't survive the winter or suffered extensive winterkill. I make a list of replacement perennials to fill in where needed. As the survivors and hardy plants begin to grow more vigorously, I can tell which need to be divided or lifted and replanted. I plan where to move excess plants or pot them up to share with family and friends. I like to add new plants to the garden every year, so if possible I buy my perennials at local garden club plant sales. I use many native plants in my gardens and the best specimens I've found are the plants purchased in my area from the master gardeners at their spring and fall plant sales. While checking out my flower gardens I look for areas in each bed that need some color from annuals and make a shopping list. I plant some annuals in the house or directly into the garden from seed; others I buy as young plants at a local garden center or plant sale and add to the garden after all danger of frost has passed. Finally, I check on trees and shrubs to see which need pruning or thinning. Some need to be pruned in early spring but others should be pruned after blooming or in the fall. 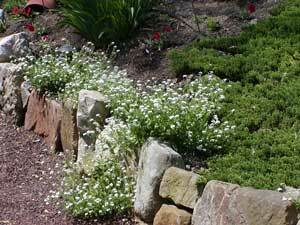 Most of my shrubs need to be pruned after flowering, in late spring.